A trip to Tesco in the morning bought almost all the ingredients for tomorrows dinner with Crawford & Nancy and June & Ian. Scamp set to to build the dessert while I sat around and solved today’s Sudoku. We all have skills, we just have to utilise them the way we see best. After the prep was done, we went out for what Scamp called “a Light Lunch”. After ticking off the likely venues on our fingers, we plumped for Craigend Nursery. It’s a plant nursery, but their big claim to fame is their restaurant/cafe. We used to go there a lot, but now not so much. I know why. Burnt water pretending it’s coffee and a panini you could hammer in nails with was not what Scamp meant by “a Light Lunch”. Having said that, her Fish Finger Sandwich which was three sandwiches of hefty sliced bread filled with deep fried fish was lovely. Three slice was too much for her, so I helped her clear her plate. The attention to detail and desire to satisfy customers was evident when the girl making up the bill asked “Was everything alright?” and Scamp replied “No, not the best”. The girl’s reply was “Sorry”. No desire to ask what was wrong or even to pass it up the chain if she felt she couldn’t help us, just “Sorry”. We’re sorry too. This used to be a good place for a lunch, light or otherwise. Now it’s a victim of its own success. Back home and there was cleaning to be done. There were also photos to be taken and I know which of these tasks was on my to-do list. Grabbed my cameras and drove down to Auchinstarry to look for the elusive kingfisher. 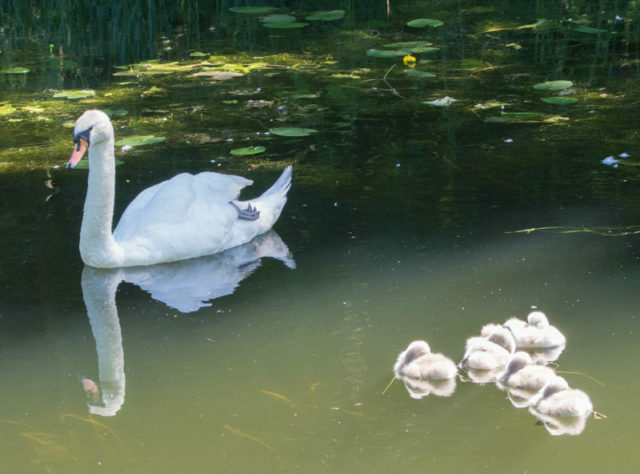 Didn’t find it, but I did find Mrs Swan out with the weans. That became PoD. Most interesting shot was a green caterpillar on a mission to cross my path as quickly as possible. Maybe it was going to a meeting or something. Used the new macro lens at ground level to get a more interesting point of view. Oh it was hot. The day had started just over 16ºc but it must have been well above twenty now. Walked back and made some bread dough to try out Scamp’s idea of bread rolls pinched from Epicurean, then sat in the garden for a while with Scamp, but without a drink as I was nominated driver for tonight, taking Scamp and Moira to a witches evening in Bonnybridge. It was after I got back and was halfway through dividing up the dough into the individual rolls, while heating my pizza dinner that our surprise visitors arrived. Crawford & Nancy stood on the doorstep thinking I was joking when I said it was tomorrow night they should be coming. I don’t know who was more embarrassed, them or me. I invited them in, but told them that Scamp was out for the night, but they refused. Hope they come back tomorrow! “Did you say it was a pizza you wanted?” YES. Poor wee soul, he seemed surprised. Why didn’t I want his pizza. He could have told me at the start that they didn’t do anchovies, but that would have taken him off-script into the dangerous territory where you have to think and that just won’t do! So, tomorrow. Should be making starter in the morning then Scamp will be assembling dessert and maybe we’ll go for lunch somewhere, but not Craigend.